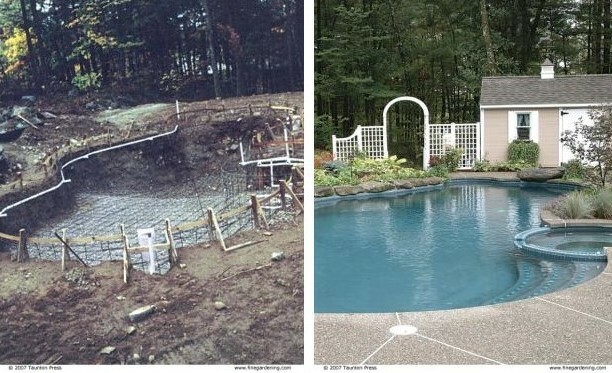 Fitting a pool into your landscape is a major investment, in many ways. You’ll need to invest cash, time, energy, and yard space. But what happens when unexpected issues arise during construction? Many times, a landscape designer will have to ask some serious questions to find out what elements are necessary for functionality and aesthetics and incorporate them into a half-way completed project. Jim Donahue, landscaper and writer for Fine Gardening magazine, recently blogged about how he integrated a pool into a landscape project that had already been started. Jim used visual cues and a sense of enclosure to make his client’s space inviting and truly “nestled” the pool into its surroundings. Although it is BEST to design the entire space –pool and surrounds together unfortunately it doesn’t always happen and I often run into the same situation described in this article. The authors covers the solutions quite well-a good read for anyone out there considering a pool!